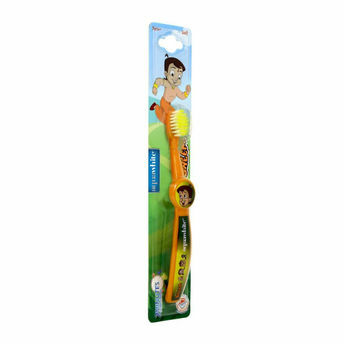 Let your kids have fun while brushing their pearly whites with aquawhite Chhota Bheem Bestie Kids Toothbrush. Exclusive license holder of Chhota Bheem characters in India, aquaguard is bringing toothbrushes featuring characters from this popular cartoon. Made with soft bristles that are gentle on your kids developing teeth and gums and a small head that fits well in your child's mouth, this toothbrush has a transparent body. The uniquely shaped handle makes it easy for children to hold. The adorable Chhota Bheem design on the brush will prompt the kids to brush on their own. About the Brand: Aquawhite toothbrushes are manufactured by JHS Svendgaard Laboratories Limited Company which has been manufacturing oral care products for over 20 years in India. The brand's mission is to enable more people to live a healthy life by improving and ensuring the health of their smile with supreme technical expertise in oral care products. Explore the entire range of Teeth & Dental Care available on Nykaa. Shop more aquawhite products here.You can browse through the complete world of aquawhite Teeth & Dental Care .